The Voters is a series of articles exploring the demographic groups of Americans who will choose the next president. Allan Banner, an Ohio construction worker who supports Donald Trump for president. WARREN, Ohio — The description of Donald Trump’s voters compiled by Gallup — they “are older, with higher household incomes, are more likely to be male, white non-Hispanic … less likely to hold a bachelor’s degree or higher education … more likely to work in a blue-collar occupation” — could also describe Allan Banner, an Ohio construction worker. Banner, 66, grew up on a farm in Liberty Township, Ohio, between Youngstown and Warren, that his family has owned for nearly 200 years. He and his wife have four children, all of them college graduates, and two grandchildren. Last year, he went back to his longtime occupation of operating heavy machinery after retiring as the head of the voting machine department for the Trumbull County Board of Elections. Banner supports Trump because he believes the candidate will be the best at “getting the government out of the way” of business, and dealing with immigration. A national CNN/ORC poll released last week showed that 68 percent of likely voters who are white and without a college education support Trump, while 24 percent support Clinton. Among college-educated whites, 49 percent chose Clinton in the poll, and 36 percent chose Trump. As FiveThirtyEight’s Harry Enten has written, if these trends hold, Trump would become the first Republican presidential candidate to lose the white college-educated vote in 60 years. A Quinnipiac University poll of Ohio released last week shows Trump leading Clinton by 41 to 37 in the state, with Libertarian Gary Johnson getting 14 percent and Jill Stein of the Green Party at 4 percent. Among non-college-educated whites in the state, Trump leads Clinton 51-27. A sense of rootedness in the Mahoning Valley community is connected to how Banner views work. He said his great-great-grandfather cut timbers to support the roofs of the coal mines; his father and grandfather worked in the steel industry. Banner and his brother worked union jobs in road construction and rebuilding or tearing down steel mills. Of the 204,000 people living in Trumbull County, 87 percent are white and non-Hispanic. The area is true battleground territory in a swing state. In Ohio’s March 15 primary, which allows people to switch party registration on voting day, there was an exodus of Democratic voters who switched to Republican ballots. Ohio’s three top counties for voters who switched from the Democratic to the Republican party all lie along the state’s eastern border. In Trumbull County, where Banner lives, there were 28,472 GOP primary voters compared to 15,329 in 2012. 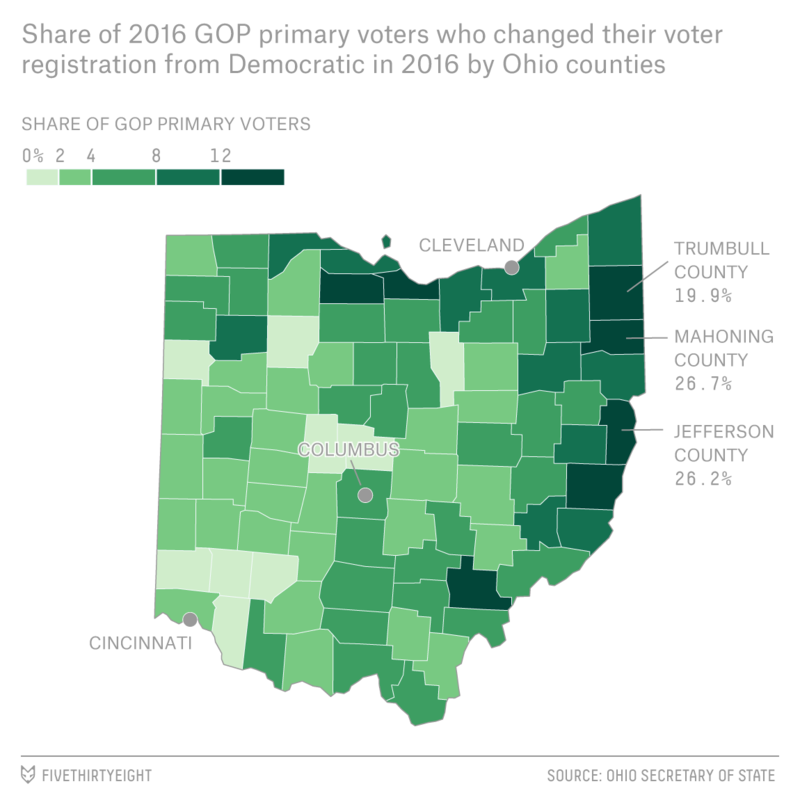 Or to put things another way, nearly 20 percent of people voting in the Republican primary in Trumbull County switched from being Democrats, while only 1.6 percent of voters in the Democratic primary switched from Republican registrations. The International Union of Operating Engineers Local 66 covers part of Ohio and western Pennsylvania. The union is officially supporting Clinton, but like many of its members, Banner is supporting Trump. I spoke with Banner at a breakfast meeting of the Trumbull County Republican Party at the Sunrise Inn in downtown Warren. A few dozen people — many clearly excited by Trump’s run — gathered around a long banquet table to discuss the party’s efforts on behalf of Trump. (They’d run out of lawn signs.) Many were college-educated, some getting degrees in midlife after working or raising a family first. Some, like Mary Theis, a real estate agent still working at the age of 81, worry about their children’s futures, and their ability to stay in the area. Theis, who was a stay-at-home mother before starting her own company, has four children, seven grandchildren and two great-grandchildren. She met Trump in person briefly, and says that although he “talks without thinking sometimes” — a trait she’s tweeted at him about — she doesn’t believe he’s a racist or has animosity towards women. She’s particularly impressed by his entrepreneurial background. 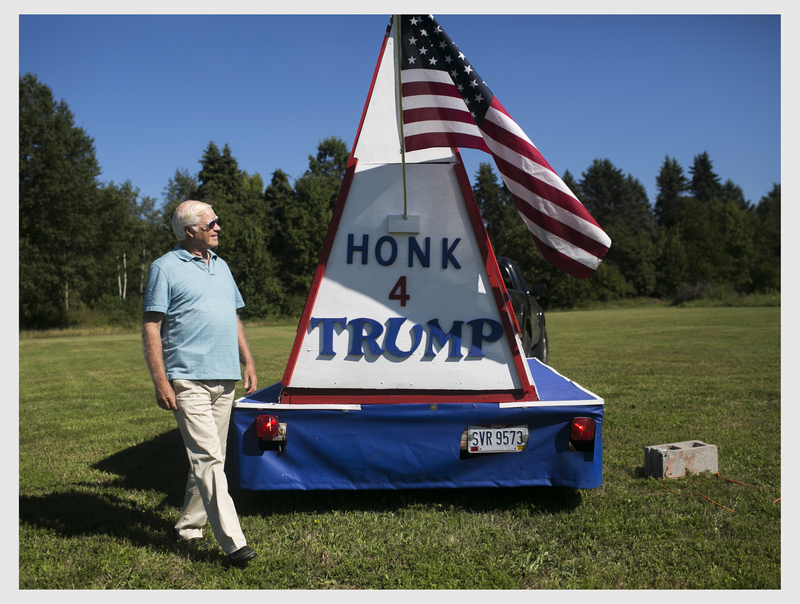 Banner’s homemade Trump trailer, attached to the hitch on the back of his truck. Several residents of Trumbull County made it clear in interviews that they did not think Trump was a racist, though some questioned some of his remarks, including his decision to doubt the impartiality of a federal judge, Gonzalo Curiel, because of the judge’s Mexican heritage. National research drawn from an analysis of the American National Election Studies 2016 pilot study found that Trump supporters tended to feel chillier toward blacks, Muslim-Americans, and Hispanics than supporters of other Republican candidates or Americans at large. Like many surrounding counties, Trumbull has experienced a net out-migration of people from the area. In 2014, the median household income was $43,226 versus $53,482 nationally, and the labor force participation rate was 56.8 percent versus 63.5 percent nationwide. Many of the people active in local politics are doing just fine economically but are worried about the broader economy. A Pew Center analysis found that after manufacturing jobs in the Youngstown-Warren-Boardman area decreased by 42 percent between 2000 and 2014, the number of adults in the middle class held steady but there was an increase in low-income adults. (There were fewer upper-income adults.) That may hint at the destabilization of the middle class ahead. The breakfast meeting was convened by the county’s party chairman, Randy Law, who also served as a state representative from the 64th district in 2005-06. 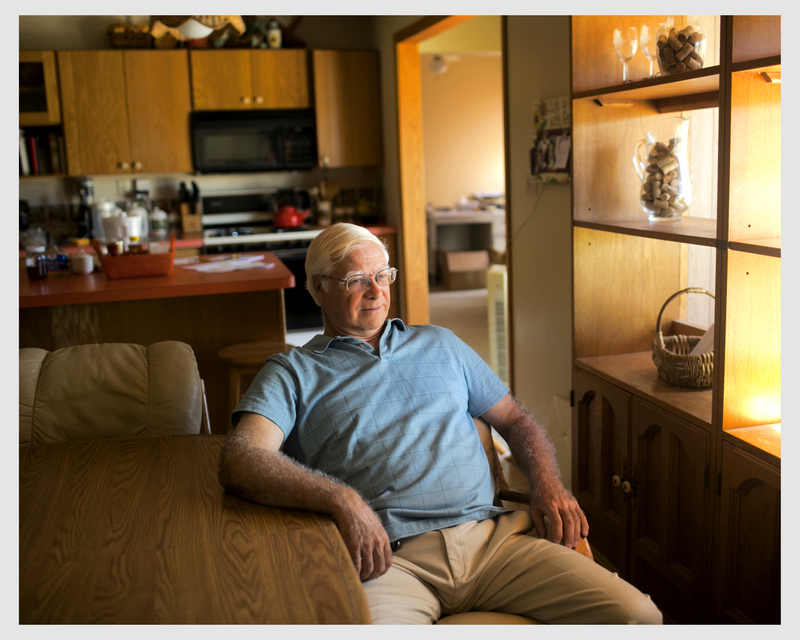 Law, who grew up in a working-class family helping a father who ran a small sign-printing business, says he wants to see Warren — and America — flourish again.